No grill, no problem! Fourth of July, Memorial Day, or just because you are in the mood for BBQ without the mess. You have to try these simple Crockpot BBQ Country Style Ribs. They are super easy to throw together and they just fall off the bone. Everyone loves them. This is one of our favorite recipes to dump and go during the summer! 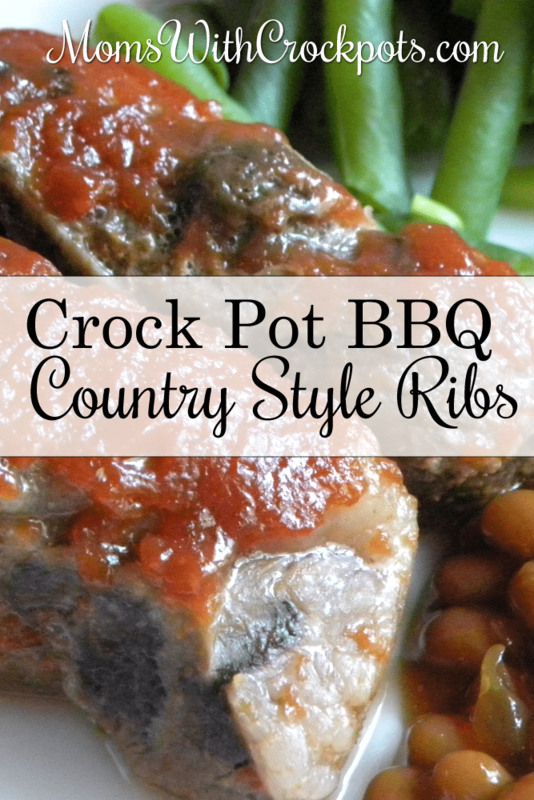 If you love bbq you need to try these Crockpot BBQ Country Style Ribs! 8 ounces cola -- Coke Dr. Pepper, etc. Combine ketchup and cola. Whisk together well. Place country-style pork ribs in slow cooker. Pour cola mixture over ribs. Cover and cook 2 hours on HIGH then cook for 3 to 4 hours on LOW. Baste occasionally if desired. I tried these ribs and they were wonderful!!! Using on three ingredients kind of made me worried, with one of them coke!!! But my family flipped over them. You have to try them. These sound good. I also make country style ribs with my favorite BBQ sauce, Sweet Baby Ray’s. Put the ribs in the crock pot and pour the bottle of sauce over them. Cook on low 6-8 hours. A huge hit in my house. Enjoy!